Quesadillas (pronounced with the l and s silent) is a Mexican snack that is also treated as an appetizer in restaurant menus. Queso means cheese in Spanish and a Quesadillas is typically a filling of cheese and other ingredients stuffed inside a tortilla and cooked again. 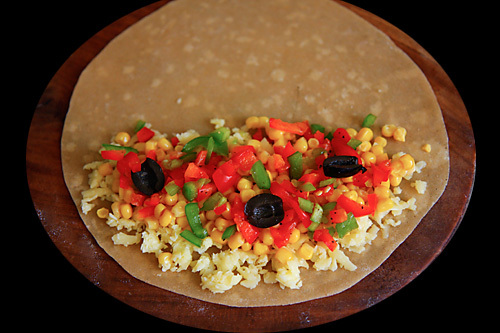 The tortilla could be corn, wheat or made with plain flour. The stuffing can vary according to region and the cook’s imagination. The combination of cheese and vegetables is quite irresistible in any form and this makes a tasty treat for children and adults alike. Picture hungry kids coming back from school and devouring piping hot quesadillas, satiating their appetites without compromising on their much wanted nutrition. Or a ravenous executive, back from a busy day at work and warming up a quesadillas to satisfy those hunger pangs. The quesadilla suits both these occasions perfectly well, and can also fit into an everyday meal or as part of a lunch or dinner party. Since I don’t get good ready made tortillas here in Mumbai, I prefer to make my own*. Once you have the tortillas ready, you can throw in any vegetable combinations of your choice and along with the cheese you are in for a fast, easy and delectable meal by itself. You can play around with vegetables here. Leftover Indian rotis are an acceptable substitute to the tortillas. Heat a cast iron griddle or frying pan over a medium flame. Assemble all the stuffing ingredients in a bowl. Divide the stuffing into 4 equal portions. Take a tortilla and place a portion of the mixture over one half of the tortilla. Fold the tortilla covering the mixture into a half moon shape. Place this on the moderately hot pan and smear a little oil over the tortilla. Press the tortilla slightly for a few seconds and allow the cheese to melt.Flip the quesadilla to the other side and smear some oil over it. Cook until nice brown spots appear and the quesadilla is slightly crisp. Take care of the heat source for the pan so as to not to blacken the tortilla. Cut into triangles. * For a vegan version, use vegan cheese! Nice… I kind of made this the other day without knowing the recipe. Ofcourse, you cant label it authentic. But I tossed in some cheese and capsicum. How do u make sour cream? And what is guacamole? And could you give a snapshot of the types of cheese and what they are used for? Am so clueless about them Cheese types. I know, I can google and figure out, but why take choose a tough option, when you're there! PS: "Picture hungry kids coming back from school and devouring piping hot quesadillas, satiating their appetites without compromising on their much wanted nutrition. Or a ravenous executive, back from a busy day at work and warming up a quesadillas to satisfy those hunger pangs." The latter sounds very familiar :). But I guess the two are hardly different. Simi: Sour cream is not readily available in India, but you can make a mock sour cream. Guacamole is a delicious dip made with ripe avocados. Will post the recipe soon. Try looking for Monterey Jack cheese in gourmet departmental stores. You can use mature cheddar which is easily available. This is Anu from My Scrawls. I was searching for some cake recipes and I landed here. Cool collection of recipes and nice presentation! Gr8 job. I love quesadillas. U r right stuffing varies as per our imagination and taste. I love to add broccoli and basil leaves and finish it off with yummy salsa 🙂 Thanks for sharing. Soumya: The red you see is red bell peppers. Hi…Is there any alternative instead of cheese. I hear ppl using hung curd, can it be used here too??? I am following a diet and cheese is a strict "NO", so i was wondering. Beena: I always make Quesadillas with cheese. You could experiment with hung curd, tofu or you could leave out the cheese altogether and substitute with more vegetables. Do let me know the results. Nice to know about your experiments. Do keep me posted. Thanks for the amazing recipe. It tastes divine with sour cream and guacamole. I made this.. It came out to be very delicious, and it is so simple to make it. 🙂 thank you Anu! Ashwini: This reminds me that I have not made this for a long time! Glad that you enjoyed it. Please post a nice recipe for salsa and guacamole! For that matter, more mexican dips if you can. Stumbling onto your blog has been a godsend. My mum and I are constantly looking out for nice vegetarian deserts and your list of recipes are just amazing. This quesadilla is also brilliant. I am gona prepare this for a picnic we will be going on soon. Thank you so much. meenal: Thanks for your feedback. I am a great fan of your wonderful world, i feel so heavenly when i visit your lovely blog. It is a fairy tale sort of world, so colourful and your writing makes it even more sweeter and lovlier. I have tried many of your recipes like dry fruit fudge, Mango and Coconut chutney, Peas pulao, which turned out excellent. I love to make food at home and keep searching for dishes like homemade…. pizzas,cakes , etc and loved all the recipes in this lovely place. 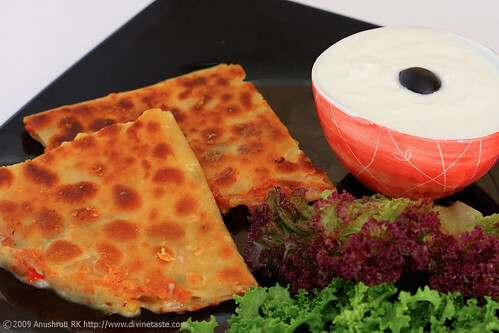 Just wanted to know can i use cheese(Paneer cheese-chena) instead of cheese in this recipe. Recently i tasted this dish at Tacobell and loved it. This looks lovely. Do we need to add salt and pepper to the stuffing mixture? Or is the stuffing just cheese,red and green bell peppers.And do i use boiled sweet corn or noraml corn for this recipe. Iam awaiting your reply as i want to make this dish ASAP as this is my husband's favourite dish and after seeing the wonderful clicks i just cannot wait. Please reply. Sunitha: Thanks for your kind words. Sorry for the delay in replying as my world is not beautiful all the time. 🙂 You could use paneer here. I think it would taste brilliant! Devi: You need to season it with salt and pepper. Will update the recipe.